Beebe Medical Foundation » Beebe Beach Bash Co-Chairs Prepare! The Beebe Medical Foundation is proud to announce that Jennifer Carroll and Robyn Rosenfeld-Aburrow are co-chairing the 4th Annual Beebe Beach Bash. This year’s Bash is a Boardwalk theme and will include favorite boardwalk eats, caricature artists, boardwalk games, dancing, music by The Fabulous Greaseband, live auction, and more. 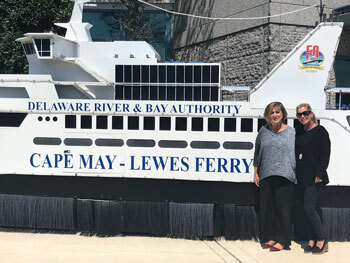 The 4th Annual Beebe Beach Bash will be held on Saturday, June 2, from 6 p.m. until 11 p.m. aboard a docked Cape May-Lewes Ferry boat. VIP guests receive reserved parking and can board the ferry at 6 p.m. to enjoy an hour and a half of private entertainment, premium liquor, and hors d’oeuvres in the vessel’s Crow’s Nest. VIP guests have access to the Crow’s Nest throughout the evening and will enjoy VIP bars on the main deck. General boarding guests will enjoy convenient parking in the ferry’s main parking lots and will board the ferry at 7:30 p.m. General boarding guests will enjoy three and a half hours of dancing, dining, auctions, and more. “We are looking forward to expanding the boardwalk theme this year! We have a lot of exciting surprises planned, including local beach eats, your favorite boardwalk games, and great auction items. This year’s auction will feature jewelry, hunting trips, a Schroeder Painting, and other one-of-a-kind items,” said Robyn Rosenfeld-Aburrow, Bash Co-Chair. This year the Bash will provide funding for the Emergency Department in Lewes and the future Emergency Department in Millville. “Recently Beebe announced our largest expansion plans in our history, including adding an a year-round free-standing Emergency Department and second location for our cancer center in the South Coastal (Millville) area. While at the same time, we continue to serve the growing amount of patients who use our Lewes Emergency Department. This annual event is a great time for the community to come out and support their local not-for-profit healthcare system while having a really fun evening. Last year, we had over 550 supporters attend!” said Tom Protack, Vice President of Development, Beebe Medical Foundation. Several companies are loyal sponsors of Beebe and have already contributed to this year’s Bash. We would like to recognize this year’s Diamond Sponsor: Schell Brothers and Platinum Sponsors: Carl M. Freeman Associates, Delaware Electric Co-Op, Jack Lingo, Inc., Megee Motors, Southern Delaware Imaging Associates, and Sussex Emergency Associates. “We are so fortunate to have many generous, community-minded individuals and businesses who support Beebe and make the Bash such a success each year! We thank all of our generous sponsors and local businesses to make this year’s Bash the best ever!” said Jen Carroll, Bash Co-Chair. To learn more about how you can sponsor and support the Beebe Beach Bash this year, please contact the Beebe Medical Foundation at (302) 644-2900 or visitbeebemedicalfoundation.org. Beebe Medical Foundation was founded in 1989 with the sole mission of raising philanthropic support for Beebe Healthcare. The Foundation was created as a separate entity to support Beebe’s long-range plans. The Foundation is located at 902 Savannah Road, in the former home of Dr. Richard Beebe who, with his brother Dr. James Beebe, founded the hospital in 1916. Caption: Shown are Beebe Bash Co-Chairs Robyn Rosenfeld-Aburrow, left, and Jen Carroll, right.